This kit carries ideal chocolate counterparts to 17 varietals for a delectable culinary experience. With a touch of velvety sweetness, the right chocolate brings out your wine's robust aroma and unique flavor profile. Give your next date night or girls' night a delectable spin with this set of four bars that pair with 17 different varietals. The rich, Extra Dark Chocolate matches a Bordeaux, barolo, cabernet, or Malbec. Velvety, aromatic Medium Dark Chocolate pairs with a merlot, shiraz, zinfandel, chianti, or Rhône. Smooth Dark Chocolate complements champagne, riesling, pinot noir, or vintage port. And a creamy Milk Chocolate tastes great with port, dessert wines, rosé, or Burgundy. Carving knife and cutting board included. Made in Ohio. I would definitely buy this gift again and again! It was a great Christmas gift for my Mother in law. 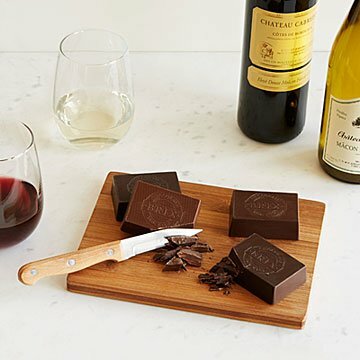 Pairing chocolate and wine is a win-win, especially when trying to think of a gift for someone last minute or with limited interests. The box was nice and weighty, and it looked extremely elegant! I got this for my Dad for Christmas since they all do Wine Wednesdays with their friends. It was great!! There is ample amount of Chocolate and the cutting board and knife was a great touch. Honestly, the cutting board was not super necessary, they have a ton of them, but it is a great touch if you want to bring the whole thing to wine tasting because it is about the size of a textbook and packs up great! I love this gift, it's fun that it's as a dessert. I wish it would have come with specific wines and possible dinner pairings as suggestions. Really fun gift though and guests are always impressed! I will give this as a gift again and again! The chocolates were delicious and the recommended pairings were spot on! A great gift for any wine enthusiast.